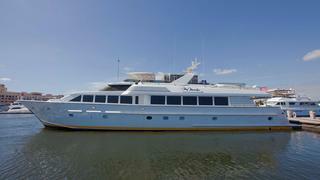 The 34 metre motor yacht My Marilyn, listed for sale by HMY Yacht Sales, has been sold in an in-house deal. Built in GRP by US yacht builder Hatteras and delivered in 1994 to ABS class, My Marilyn was designed by the legendary Jack Hargrave. She was still under her original ownership and had never been chartered. A four cabin layout consists of a king size master suite and three queen size VIP suites and all cabins have entertainment systems including built in television screens and en suite bathroom facilities. Her 7.5m beam creates a very spacious main saloon layout incorporating a formal dining area. Oversized windows in the saloon offer guests a spectacular view of the surroundings and the light flooding in shows off the detailed joinery work throughout the yacht. A combination of crown mouldings on the woodwork and silk wall coverings give her an air of timeless elegance. A full wet bar is positioned against the aft bulkhead with a cut out window enabling guests lounging on the aft deck to be served with cooling drinks. The large upper deck offers a Jacuzzi, sun pads and a custom wet bar with a full size grill – ideal for al fresco cocktails followed by dinner. My Marilyn is also suitable for cruising in the Mediterranean, equipped with a dual power coverter, a large stern passarelle and aft deck capstans. Powered by three 1,350hp Caterpillar engines, she cruises at 17 knots with a range of 1,250 nautical miles at 14 knots. Lying in West Palm Beach, Florida, My Marilyn was asking $1,899,000.